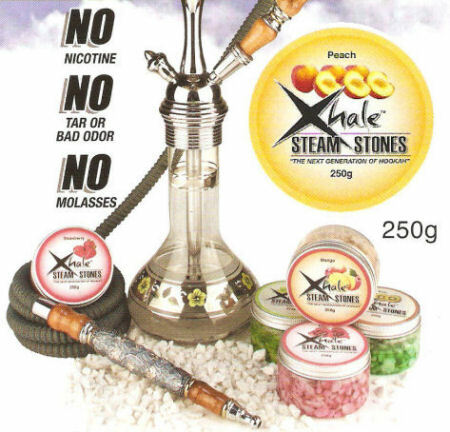 Called “the next generation of hookah” the new Xhale Steam Stones were created as a smoking alternative based on the same concept as electronic cigarettes, or e-cigs. In both cases, an evaporation of liquid takes place that looks identical to regular smoke, but lacks many of the harmful chemicals. The Xhale Steam Stones work like regular hookah, or shisha, tobacco without the carcinogens, carbon monoxide, and guilt associated with traditional tobacco smoke. Xhale Steam Stones are easy to use and are enjoyed the same way as regular hookah tobacco. Shake the jar thoroughly, then place a few spoonfulls of Xhale Steam Stones in the bowl. (Using a funnel-style bowl is required.) Cover the bowl with aluminum foil and perforate with small holes. Place the heated coals on top of the aluminum foil. The stones take about 2 minutes to heat up. When they begin to steam, theyre ready to use. The stones will steam until they are done with no unpleasant or unwanted flavor, guaranteed.